ROCKINGHAM, N.C. – While Top Fuel driver Steve Torrence was picking up a check for a mere $50,000 as winner of the NHRA Fall Nationals Sunday at Dallas, Texas, three different drivers in far less powerful cars were departing Rockingham Dragway more than $100,000 richer after big victories in the SFG Super Bowl of Drag Racing. 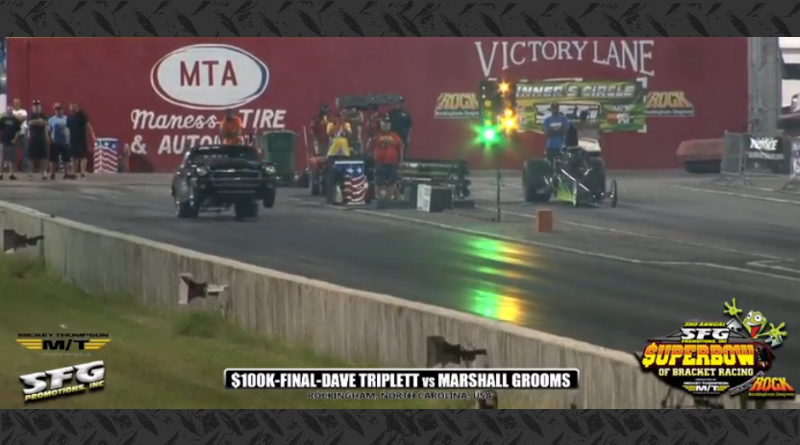 Grooms got the final $100,000 by driving his dragster past the 1972 Chevy Vega of Dave Triplett of Eustis, Fla., on Sunday. Lynch got a win for the door cars on Saturday when he and his Chevy S-10 pickup ran dead-on their 5.920 target to hold off the dragster of Kyle Cultrera of Eliot, Maine. Carr got the first big check by beating Graham’s John Lassiter and his 1966 Chevelle on Friday. DragChamp is your source for drag race results online. Visit our site daily for the lastest big money bracket racing results including SFG Super Bowl of Drag Racing results. ← “Catfish” Collects $100K At SFG Super Bowl At The Rock!